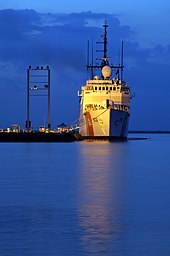 The Medium endurance cutter or WMEC is a type of United States Coast Guard cutter mainly consisting of the 270-foot Famous- and 210-foot Reliance-class cutters. These larger cutters are under control of Area Commands (Atlantic Area or Pacific Area). These cutters have adequate accommodations for crew to live on board and can do 6 to 8 week patrols. 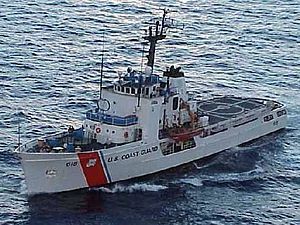 Other ships in the classification are the 282-foot (86 m) USCGC Alex Haley, 213-foot (65 m) USCGC Acushnet, and the now-decommissioned 230-foot (70 m) USCGC Storis. There are 13 vessels in the Famous class, and 14 vessels in the Reliance class. The Coast Guard plans to eventually phase out both of these cutters and replace them with the Offshore Patrol Cutter as part of the Integrated Deepwater System Program. The Famous-class vessels have hull numbers in the range WMEC-901 through WMEC-913. Entering service in the 1980s, the Famous-class cutters, designed as replacements for the 327-foot (100 m) Treasury-class cutters and their mission profile, emphasized law enforcement, particularly patrolling the newly established 200-mile (320 km) exclusive economic zone. USCGC Harriet Lane (WMEC-903) moored at Guantanamo Bay Naval Base. The Reliance-class vessels have hull numbers in the range WMEC-615 through WMEC-630. Entering service between 1964 and 1969, the Reliance-class cutters were meant to replace the 165-foot (50 m) cutters of the Prohibition era and were the first major cutter replacement project since the 255-foot (78 m) Owasco-class cutters from World War II. USCGC Diligence (WMEC-616) in 1965. Note the lack of exhaust stacks and the exhaust ports on the transom on the original design. Reliance class cutters would have the stack added during future overhauls.